Lamott is fun to read because she is so very over-the-top nuerotic. There were parts of this chapter, the one called "Publication," however, that were downright irritating and others parts that rang with clarion-bell truth that engraved my bones. Glad you're along for our book club. My life has been enriched by reaching a broader audience. Writing five novels has confirmed that I can accomplish big things. Composing a story weighing in at 100,000 words is like climbing Mt. Everest in the dark, without a camera or witnesses. It's big! Satisfying. Intoxicating. Privately, it's a golden handshake. And people invite me to speak to groups large and small. Trust me, when I was changing diapers or teaching school, no one invited me anywhere to say anything. I thoroughly enjoy this perk because there are things I care about, and now people will listen to me--or pretend to listen while licking chocolate cake off the tines of their forks. Over the last ten years, I've had amazing opportunities to share God's faithfulness, encourage artists and craftpeople to value their abilities as gifts, teach the craft of writing to aspiring writers, and convince rooms full of librarians that fiction is more truthful than nonfiction. I really, really like this part, but the invitations are dwindling since I haven't published anything in some time. Boo! Hiss! All that I know about the relationship between publication and mental health was summed up in one line of the movie Cool Runnings..."If you're not enough before the gold medal, you won't be enough with it." Being a published writer is humbling. One day you're a rock star--your publisher is buying full-page ads in magazines, telling the world you're the fresh voice in fiction, and PR people know your number by heart--and the next day, a review comes out in your local paper. It's the worst review ever written, and now your neighbors are blushing for you and avoiding eye contact at the grocery store. Your mother even writes a letter to the editor. You're wondering if it's too late to crawl back into obscurity. It is, sorry to say. But you are still standing, and you're discovering other reasons to put yourself out there. All of this is to say that you need more than being published to "be enough" for yourself. While plotting and researching, spend time with people who love you and some that you choose to love. Nurture those relationships as fervantly as you nurture your craft, even moreso. This includes the One who loves you most, the Lord Jesus Christ. He's crazy about you! He cares little about what you do. (Publishing contracts are used in bird cages in Heaven.) 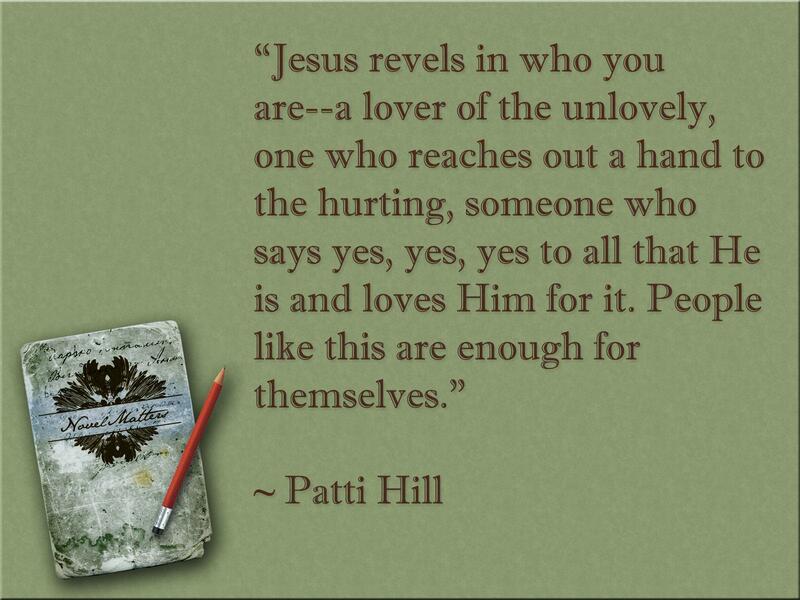 Jesus revels in who you are--a lover of the unlovely, one who reaches out a hand to the hurting, someone who says yes, yes, yes to all that He is and loves Him for it. People like this are enough for themselves. This should be your goal before publication. Has publication been all you dreamed? What "gifts" do you welcome most from publication? Which challenge you? How do you prepare yourself to face the ups and downs of publication? We have one more chapter of Lamott's book Bird by Bird to discuss. Any other suggestions? This is a wonderful post, Patti! I have dreams about being published, but I'm realistic about it. I know I can't quite my day job! It's important to feel grateful for wherever you're at in the journey, whether it's unpublished (temporarily!) or multi-published. Take nothing for granted! I'm in the beginning stages of publishing...just weeks out from actually KNOWING about it. I've always been pretty realistic about the business and have very few expectations. But there was one thing I didn't expect. The post acceptance FREAK OUT! Obsessing over the fear that it wasn't good enough. That this line and that weren't going to work. That my college professor turned mentor would hate it. That I used one harsh word a few too many times. And on and on. Then, Easter Eve, I went to Target. For plastic eggs and chocolate (some of the latter for me). I walked through the fiction section, looking to see if I should buy myself something to read. It hit me. Right there. My book would have a cover, (hopefully) an audience and some people might not like it. I got all shaky. Then, I moved on to the Easter stuff. I nearly fell over from the fear. I didn't expect that. But I'm much better now. Laura: You're very wise. It IS important to enjoy the journey of creating story and to be grateful. Thanks for jumping into the conversation. I needed to hear that. Susie: You are completely normal! All pre-pub authors--if they're honest--walk the ragged line of anxiety over their soon-to-be-seen work. It would be, for some, like being asked to walk around naked in their neighborhood grocery store. Your reader is going to get a glimpse into your thoughts, know what you value, how you think the world should work. Scary stuff. I promise, the anticipation is worse than reality. It will be quite different from your imaginings. Think affirmation. What I find hard to deal with post-pub is the awe some people express. I am not awe worthy. I simply worked hard, worked steadily, and had fun playing with my characters. *Sigh*.... Patti, I love how you write. Karen: Lovely to hear from you, sweet. I would love to be in your shoes...life tumbling inside! I promise you'll be quick-witted before you know it. You'll have to be! I don't want to publish. But I do want to share this 'something wonderful' I have found. I wish there was some other way of sharing it. Sharing it because I love it, but Satan has surrounded me with people who say, "You are the only one who likes that color,place,pizza,etc. ···" fill in the blank. My time has not yet arrived. God is still working on me and my story. 1) I love Bird-by-Bird and there is an audio of a talk Lamott gave at a book festival called Word-by-Word that goes with the book. Love 'em both. Have yet to read any of her fiction, though. Susezine: I have read some of Lamott's fiction. I like her fiction, but I love her memoirs and essays so much more. I'm always happy to see a new title come out from her. Henrietta: I'm so glad Susezine dropped by to chat with you. I think her advice is right on. It's very difficult to quiet the opposing voices. It really is easier to listen to something else, like music. And I'm very careful who I share my creative ideas with, especially for a new story, but it's like having a new baby, all I want to do is talk about it. I highly recommend The War of Art to you. I'll be reading it like a devotional as I restart my writing project tomorrow. Join me? Patti, how wise this is, and how right you are. About everything. I mean today, but I'll bet you're right a lot on other days, too. Writers who shop at Walmart and Target. What would Hemingway think of that? Henrietta, you're the only one? Yippee! You must be on to something. There are too many "sames" in the world. Please - find ways to show us the world from your eyes. Patti, as usual this is a terrific post. I've so enjoyed going through Bird by Bird with you. This post is very grounding. I remember the magic of getting that contract, seeing the cover designs, then seeing my books in print. Magic, magic, magic. Then reality sets in. It hasn't changed my life, not really. But it has expanded my borders, it's brought new people into my life, and the glimpses of me that I've exposed to the world have had some positive feedback. Very satisfying in a very grounded way. Karen, so happy to hear from you!!! When is the baby due?